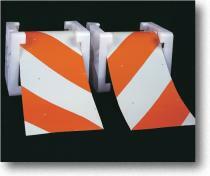 Our orange and white pre-striped reflective barricade tape is ideal for repairing or making your own barricade. Engineering Grade ASTM Type I and Super Engineering Grade ASTM Type II barricade tape is available in 8”, 10” and 12” widths in 50 yd rolls, and comes with 4” or 6” strips slanted left or right. Also available in High Intensity ASTM Type III. Please Inquire. See our Reflective Hazard Stripe tape when less stringent specifications are required.